Directions: From I-5 exit 208, proceed east on State Route 530 to Darrington. Continue through Darrington on SR 530 7 miles to the Sauk River Bridge, then on Suiattle Road 11 Miles to the "Y", 1 mile beyond entering Mt. Baker National Forest. 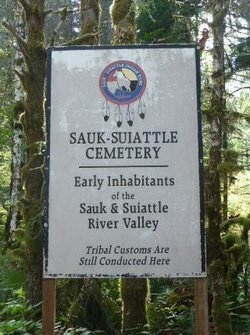 Cemetery is 100 feet on the right and can be seen from the road.